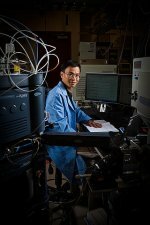 Congratulations to Dr. Wei-Jun Qian, a bioanalytical chemist at Pacific Northwest National Laboratory, who was named winner of a Presidential Early Career Award for Scientists and Engineers (PECASE) for his work in proteomics. The PECASE is the highest honor given by the U.S. government to scientists and engineers who are at the start of their careers. Qian and his fellow PECASE winners will be honored at a White House ceremony on Oct. 14, 2011. Qian, who came to PNNL in 2002, is developing more accurate methods using mass spectrometry to measure protein concentrations, which fluctuate as cells go about their daily tasks. He's also exploring novel ways to detect how and when certain proteins undergo modifications, such as when some protein functions are turned on or off.This information can help make the biological production of biofuels and other bioproducts more efficient. It can also help improve the way diseases are diagnosed and expand understanding of how diseases progress.